The big kid turned 11 a few weeks back, and for various reasons we didn’t have her birthday party until today. She’s obsessed with all things Once Upon a Time right now and requested that as her theme this year…not an easy thing to pull off. Walmart sure doesn’t carry those kinds of decorations and as seen in previous posts, I am so not a crafty lady! But I am determined and creative. I can usually throw something together and make it work out alright. ​I chose gold, black, and navy blue, and white for the colors since that’s what’s on the posters that I’ve seen. 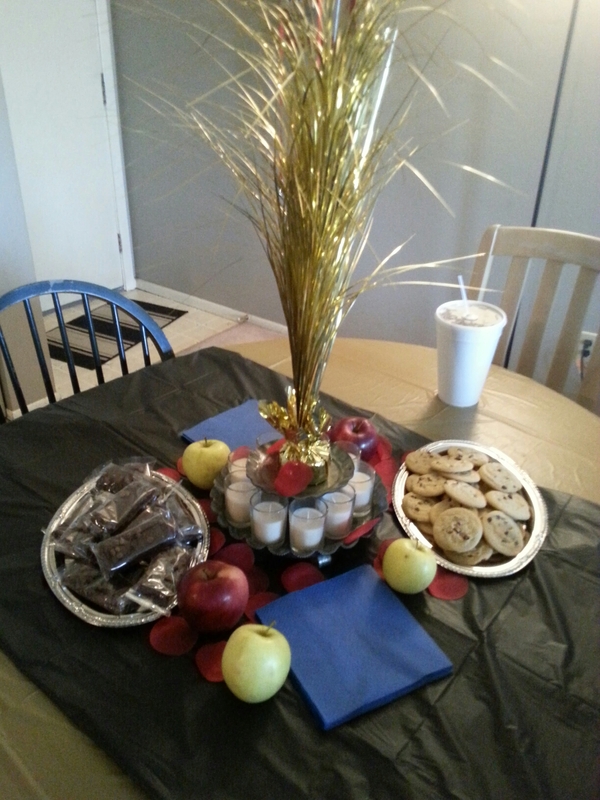 ​I used apples as some of the decorations and as snacks for people, threw some fake rose petals down (Beauty and the Beast shout-out), and put out some chocolate chip cookies and store bought brownies for more snackage. 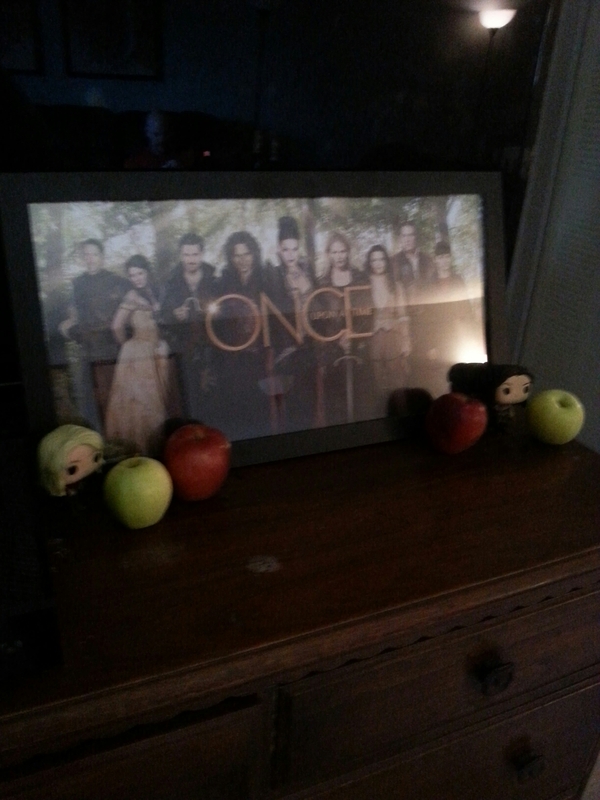 ​Some of the kiddo’s stuff became decorations as well as more of the apples. 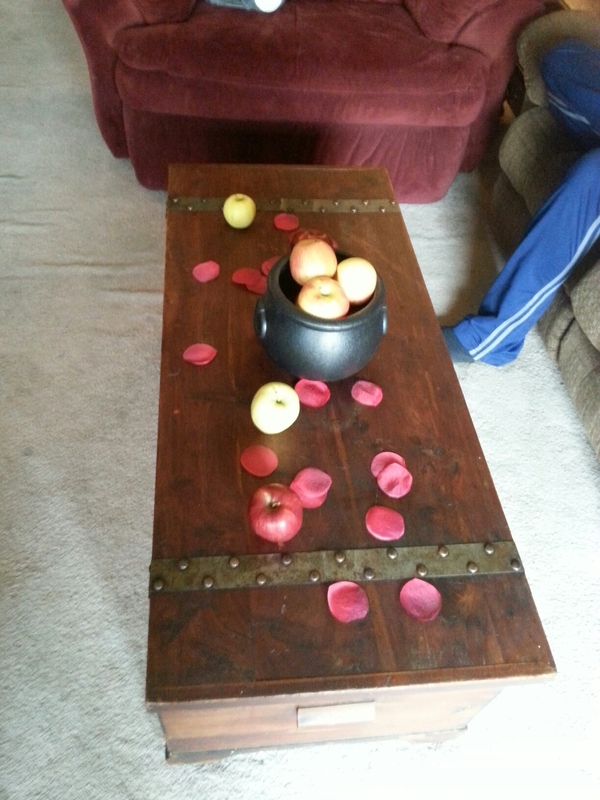 ​The coffee table with the wicked witch’s apples. 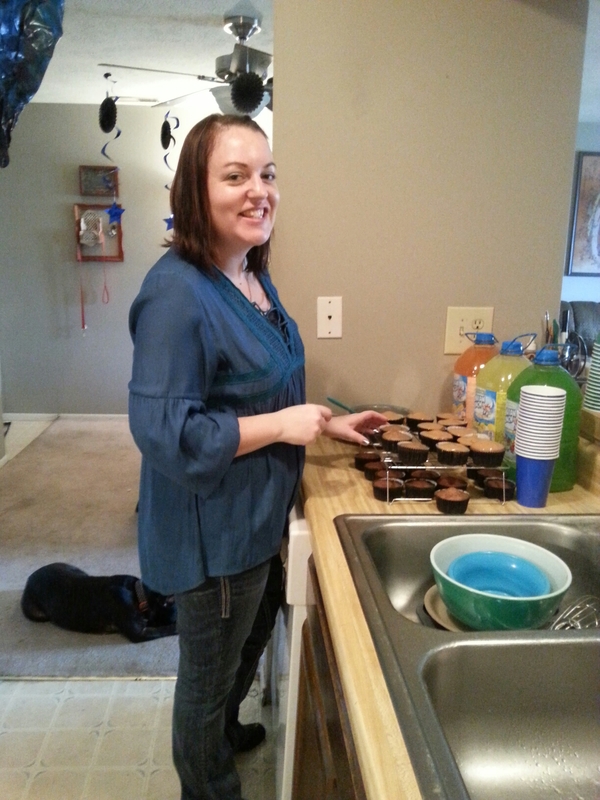 ​My unbiological sister helping me put together the cupcakes. 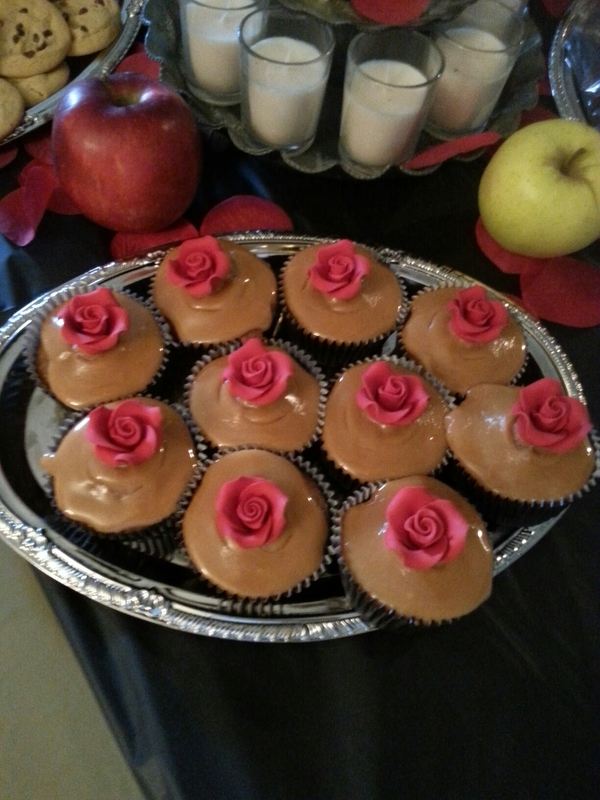 ​I’m super proud of how these turned out…caramel apple cupcakes with roses on top! These tested me so much. When my first batch was in the oven, I went to pull open the door to see if they were done yet and I’ll be damned if the oven handle didn’t come off in my hand! The Mr. had to be my hero and fix it for me while I hyperventilated and wondered how in the hell I was going to fix the rest of my cupcakes! And you ever made caramel icing? It is surprisingly frustrating to unwrap all those caramels and takes forever to melt them down. ​This was my absolute favorite part of putting together the party! The hearts in a box, ala Snow White and the Huntsman. The evil queen wants Snow White dead so she hires a hunter to kill her and bring her the heart as proof of Snow White’s death. 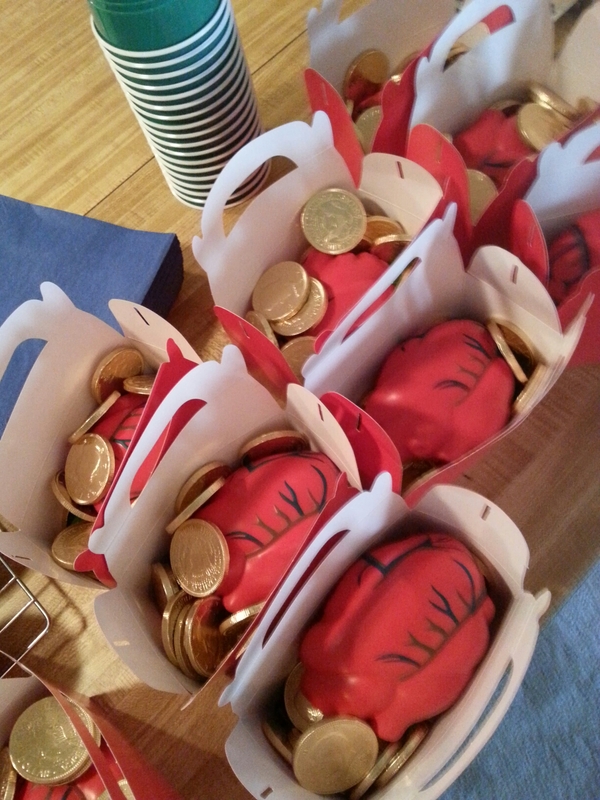 So I came up with these little numbers – heart stress balls (for squeezability when you want to crush your enemies’ hearts) and filled the rest of the box with gold coins as a nod to the payment the hunter received for his dark deed. Thank you Amazon for having the perfect item readily available and shipped in two days! Lol. 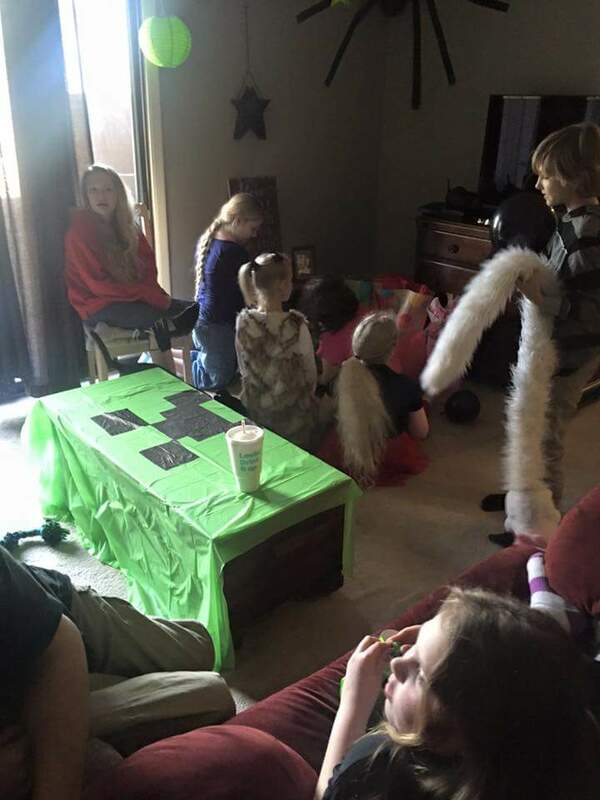 All in all, the party was a big hit for the kiddos and I am so so happy it’s all over and done with until next year. My oldest daughter hit double digits this year. I actually had a really hard time with it, for personal reasons…her turning ten means that my father has been gone now for ten years. I was always a daddy’s girl and losing him had been one of the hardest things I’ve ever had to deal with. But as we all know, life still moves on. And Sophie turned ten. TEN. Jeez! 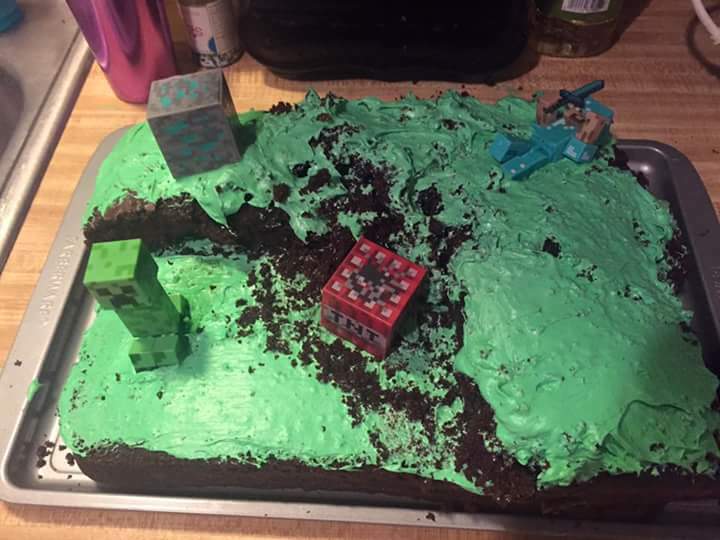 She has been really into Minecraft for a year or so, and thus requested a Minecraft party. I thought, awesome! Minecraft is extremely popular. I’m sure I’ll find tons of decorations to make it easy on me. Nope. Not at all. Or at least not in my tiny town or the surrounding bigger ones. Online I found a few things, but they were more than I was willing to pay and then my procrastination meant they wouldn’t arrive in time anyways. So what’s a mama to do? Hello, Pinterest! The place where you see some of the most amazing things and feel so inadequate. Lol! Seriously, I don’t know how some off those people manage to pull it off. I wish I had the tiniest fraction of their talent! I may not be crafty, but what I am is creative. 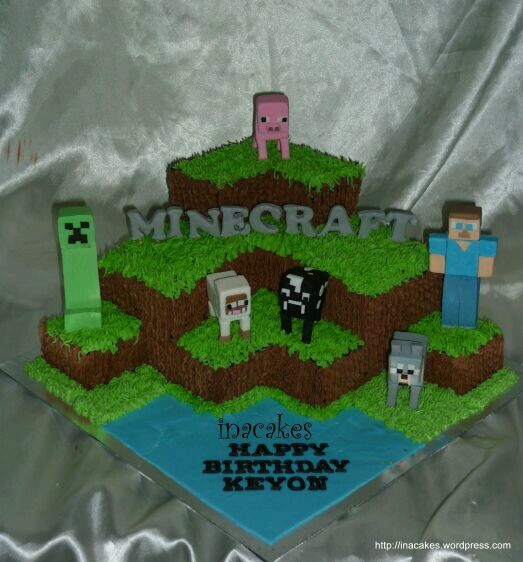 So I got to work collecting party items in the signature black and green that signals “Minecraft” to the masses, and the result was a slightly unconventional but still really fun birthday party. Behind the gaggle of birthday attendees here, you see the green tablecloth my sister-in-law spent a good twenty minutes drawing a creeper face onto. 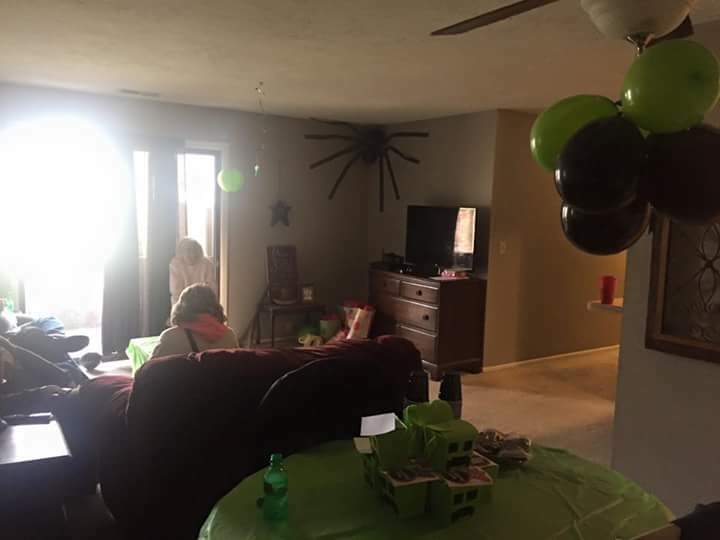 From behind the scenes here, you can see the big balloon and streamer spider we made and stuck in the corner, complete with four red eyes painted on there. These were really simple to throw together and everyone loved them. My four year old is now insisting she wants some at her birthday party next year, she liked them so much. 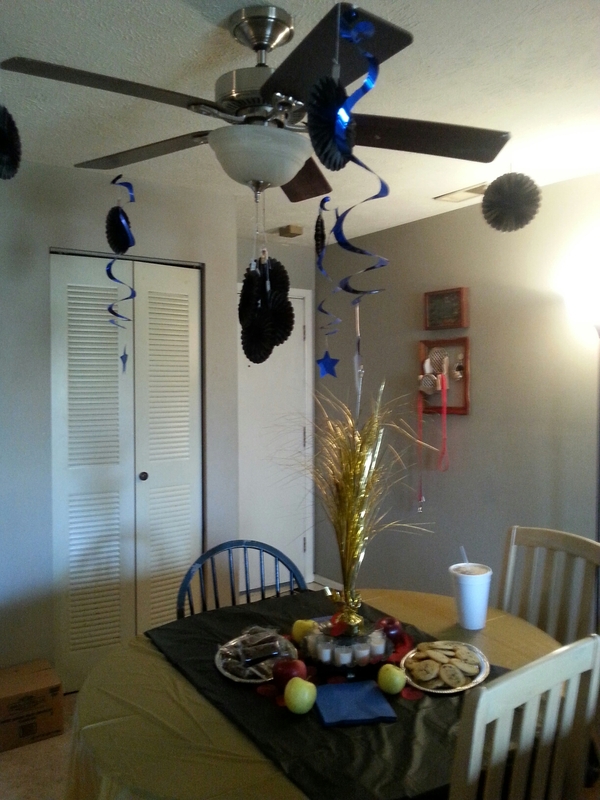 The table, all decorated up to make the kids happy. 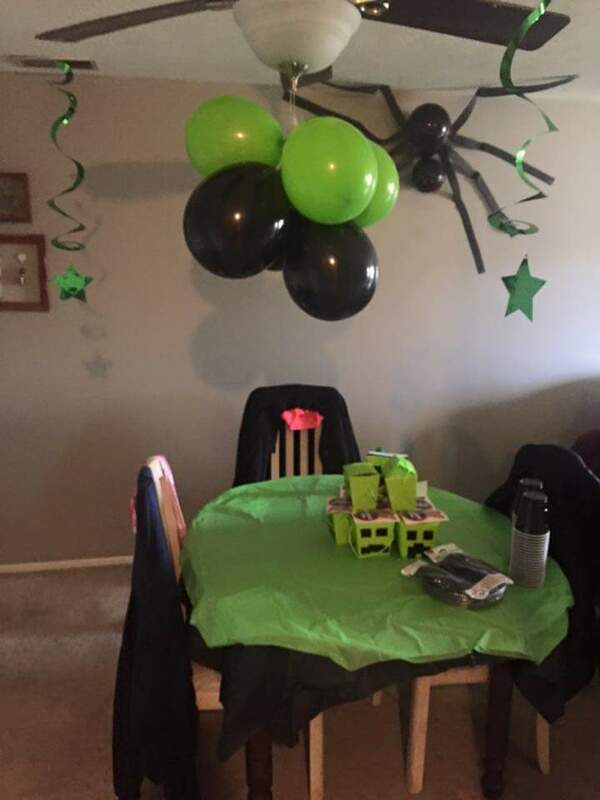 You can see another spider on the wall, our balloon chandelier, and the creeper boxes on the table are actually the party favor boxes. You can’t see it, but they’re filled with green and black candies. Just in case I didn’t wind them up enough with cake, ice cream, and karaoke. Ha! With the layers and the little figures. I thought, that’s easy enough. Bake two cakes, and one you can just cut up to make layers. Throw green icing on top, put your little figurines in that you can buy at Wal-Mart, and you’re set. 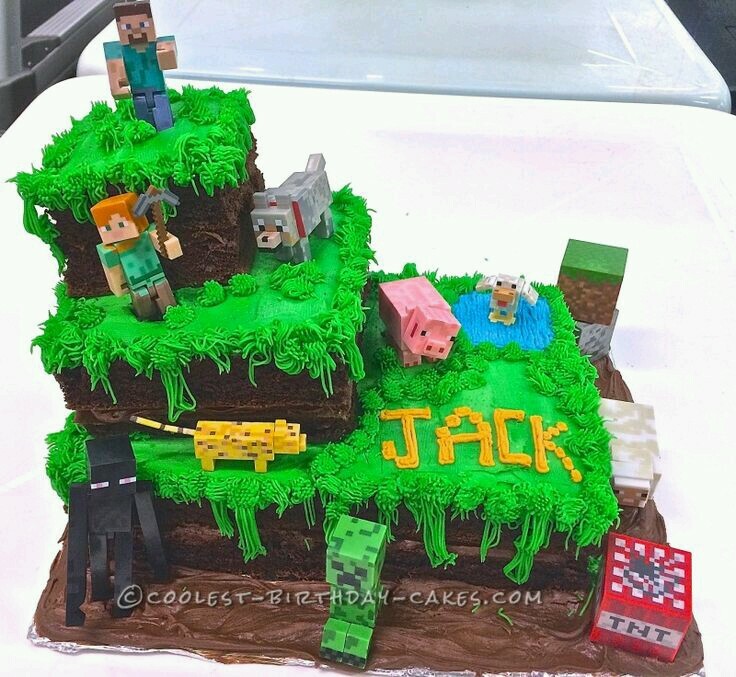 My cake wasn’t stiff enough to do that with. It was moist and kept crumbling on me, then the crumbs would spread around with the icing. The icing, which, btw, does not come in that color from the small cans you buy at the grocery. You have to use food dye. I also highly recommend against taking a swig from the bottle when you’re done to see how it tastes. For one thing, it’s gross, and it will dye your lips and teeth. You will brush for fifteen minutes to get it off. You will, however, laugh about it the entire time. Or maybe that’s just me. So what did I do with my disaster? I looked for a dinosaur in the girls’ rooms. How else could I try to explain this mess? Found none, so I stuck a TNT box there with a creeper running the other direction and Diamond Steve being thrown onto his back from the explosion. Like I said, I’m not crafty by any means. But I am creative.